This is the story behind my Guinness World Record™ for the Fastest time to halve 10 matches with an axe. Thank goodness a retired Italian man came to my rescue for this. I spotted what I considered to be the perfect hatchet for this attempt, and asked to borrow it. The owner was happy to do so, but it was blunt, and that was no good at all – not when there’s a world record title at stake! So I politely sent him home to his workshop to sharpen the curved tip and when I ran my finger along the shining newly cut edge, I could feel I had a very sharp tool in my grip. It was precisely the size, weight and length axe I’d been looking for, and I was excited to have found it. Roughly a year earlier, I’d tried this world record attempt at a furiously popular club, packed with young folks having a good time. I’d laid out all I needed and crouched alongside the chopping board when a notably brazen fellow removed the axe from my hand and began wielding it about. I was in a state of shock, and before I knew it, he’d more-or-less take over my event. It was a disaster. But that didn’t stop me trying to get my axe back, knowing a night club was the last place an axe should get into the wrong hands. A minute or 2 later, I’d quelled the situation and I left, believing that to be the safest decision at the time. My witnesses and I read over the rules. I thought through what I’d need to do, and laid a blanket around the cutting area which I hoped would catch any flying half-matches. When the timekeeper instructed me to, I struck out at the 10 positioned matches with precision and great speed. My eyes could hardly keep up with my hand movements and all I could do was hope that I’d hit each match in the middle, breaking it in half. About 3 seconds later, I sat upright and looked around. A single match still lay on the chopping board, partially cut but still intact. When I saw that, I knew the attempt had failed. So all of us gathered the bits of matches strewn around the cutting area and removed them, I laid out another 10, and we got ready to try it all again. In a blizzard of strikes I smashed the axe into all 10 matches and sat back on my haunches to see what the result looked like. Again, I’d missed a match so we cleaned up and re-tried. This went on for much of the afternoon until my forearm was aching from wielding the hatchet so many times at such speed. Through it all, my mind still wandered just a little. I was thankful I wasn’t a wood chopper by profession. It’s not that I wouldn’t be able to learn, or that my arms aren’t strong enough. No. It’s because production forestry plantations actually cause a lot of ecological damage. Biologically diverse forests are replaced with single-species plantations and that means countless small creatures lose their homes so that more wood can be produced for a wood- and paper-hungry world. It’s a matter of concern, but so is my ability to chop matches. And so, when on one attempt I sat upright and heard both witnesses cheer, I thought I must have done it, and helped them scout around for the halved matches so we could assess my work. It took a few minutes to collect sections of match clinging to the blanket, lying around the board, and even some that had been sent flying in various directions around the room. I was eager to piece them together with the witnesses watching closely and to my pleasure, I saw we had 10 matches exactly. With haste, I made sure the witnesses completed what they needed to do. My excitement level was high, but I knew that I had to receive the final result via the judges and I was in a hurry to get that. Not long after this event, I mailed my evidence off to the judges as I thought about how I’d utterly smashed them individually. 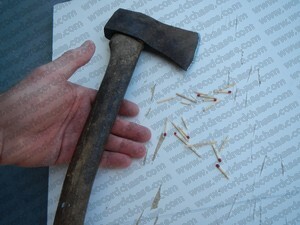 Maybe I have a match obsession, given that I thoroughly enjoyed striking them in half, again and again. Or perhaps cutting matches is simply good stress relief. Who knows. But what I do know is that I’m now officially the world record holder for chopping matches in half because that’s the result I got from the judges. And I’m a happy chap.